Ag Hall, April 4th, 12 noon. Take part in the Lions World Lunch Relay which kicks off the Lions Friends and Neighbors month. At noon, Friday, April 4th, New Zealand time (= Mayne Island time less 20 hrs.) New Zealand Lions Clubs will gather with friends, family and neighbors for lunch and fellowship, and then other Lions clubs across the time zones of the globe will follow their example with lunch at noon. On Mayne Island, come to the Ag Hall on Friday noon, April 4th for a simple lunch and friendly greeting, whether you are a Mayne Islander or a visitor. It will be a simple soup & sandwich lunch and the cost is BY DONATION ONLY. In order that Linda, at the Bakery, has enough time to prep for the lunch, please let Dennis Watts know ASAP or by Tuesday evening, April 1st. at the latest. In your reply please mention if it will be only you, or you and guest, wife, girlfriend etc. Pets do not count. Lion Bill Warning coordinated a group of around 10 Lions who helped clean up the outside of our much used shed. The Lions tidied up around the shed, cleaned the gutters and walkway, and power washed the walls. 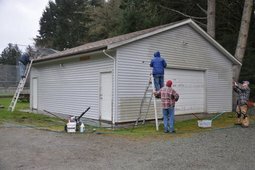 Cleaning gutters and power washing. Lions Richard and Neil cooked burgers for the volunteers.